He longs to embrace the Renaissance idea of higher education – that it affords the life fulfilled with curiosity, critical thinking skills and never-ending learning – but is cognizant of the money spent on tuition and the desperate need of students to find jobs after graduation. He knows that life after graduation is filled with collaborative work, but that students as a whole hate group assignments in college courses. Getting them to come to 8 a.m. classes is even harder. He believes “conformity is the enemy of creativity” but requires students to meet deadlines and follow classroom rules. He knows that formal education and good grades are indicative of intelligence but realizes that some of the smartest people he knows have neither. Nonetheless, there are four things he wants students to take from his classes. Be an interesting person. Enjoy what you do. Life is bigger than you. Think for yourself. For Scudder, teaching goes beyond the physical classroom. He wants students to grow by studying abroad because he believes they will never view the United States the same way again after learning in a very different culture. 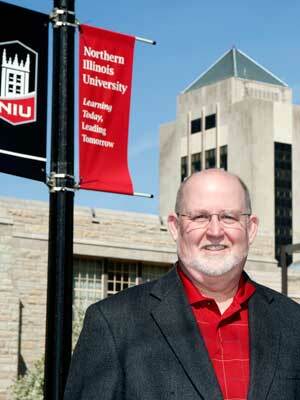 Scudder, who came to NIU 1996, holds a Ph.D. in communication theory and research from Indiana University, where his interests in the integration of technology and the classroom began. Even though he loves technology, he knows some forms of technology such as PowerPoint can encourage mindless taking of notes without challenging students to think. Scudder also knows that sometimes he is the student. What is not conflicted is his commitment to students and their success. Scudder won NIU’s Excellence in Undergraduate Teaching Award in 2003, a year after he was named the outstanding undergraduate teacher of the year in the Department of Communication. An accomplished researcher in the planning and implementation of technology, he also leads campus efforts in that area to enhance student learning. He was the leader of a team of his colleagues who, along with the networking efforts of their department chair, successfully sought and obtained a $100,000 gift from GTE that launched creation of the Telematics Lab. Those things are in the past, however. Scudder prefers to live in the present.